Pittsburgh’s North Shore area is a fast-rising, favorite spot for enchanting wedding photography. This area has it all: sweeping sports venues, spacious streets, a lively art scene, historic bridges and the storied Allegheny River. Your snapshots can include the city’s fabled downtown “Golden Triangle” area, too! The Steel City’s Cultural District is situated directly across the river. The North Shore is easily accessed from anywhere in and around Pittsburgh. PA routes 28 and 65 run nearby, while I-279 brings in traffic from north & south of the city. Once you’ve reached this picturesque area, you have a virtually endless supply of wedding photo backdrops. A great way to kickoff your picture itinerary is Heinz Field, home of the six-time Super Bowl champion Pittsburgh Steelers. Heinz Field opened for the 2001 NFL season and has sold out every game since. The stadium’s trademark “Heinz mustard yellow” seats and contemporary architecture will serve as a sports-themed background for your shots. Have your photographer snap some pictures along North Shore Drive and Art Rooney Avenue. Heinz Field’s open end faces the Allegheny River and lends dramatic scope & scale to any picture. Inside, the stadium’s Great Hall area honors the rich tradition of both the Steelers and Pittsburgh Panthers. Be sure to check pricing & availability if you’d like to take wedding pictures inside; there is an access fee. This area is ideal for sports fans in general and Steelers enthusiasts especially. And, in sports-crazy Pittsburgh, pretty much everyone falls under those two categories! Speaking of sports, why not take a short stroll over to PNC Park? The Pittsburgh Pirates’ ballpark is widely regarded as the finest field in all of Major League Baseball. Your wedding photography album will show a winning style with this splendid backdrop! Try the intersection of West General Robinson Street and Mazeroski Way. 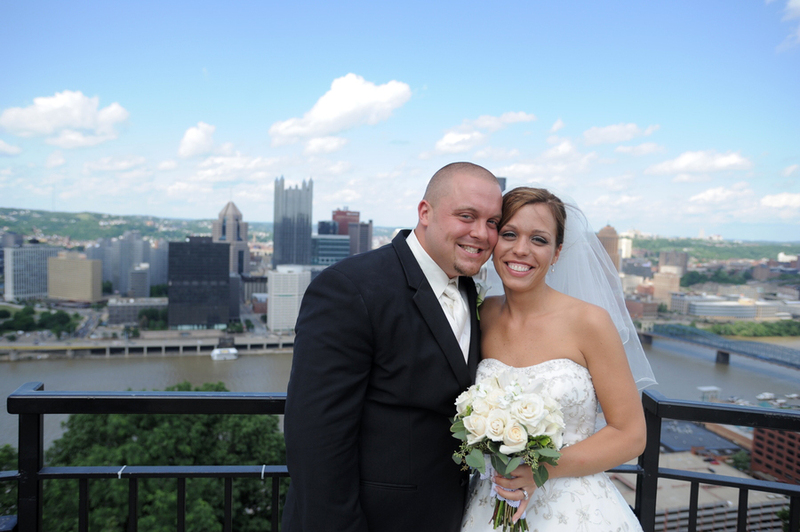 The field’s grand entrance is a superlative spot to include both PNC Park and downtown Pittsburgh in your photographs. You’ll find statues of former Pirate greats Honus Wagner, Willie Stargell and Roberto Clemente scattered around PNC Park. For additional depth & detail of this architectural standout, take Federal Street toward the Allegheny River and onto the Roberto Clemente (6th Street) Bridge. This expanse has wide walkways and provides idyllic backdrops of both PNC Park and downtown – especially the aforementioned Cultural District. Noteworthy shots can be taken during the early evening hours, as downtown and PNC Park light up. The river’s reflective quality brings additional ambiance to your wedding photographs. Federal Street also has modern storefronts and a clean, contemporary look to offset the classic architecture of Pittsburgh’s Golden Triangle and riverfront structures. If you’re a diehard Pirates fan, you might want to shoot some photos from the stadium’s north end upper deck, facing downtown. Call ahead or check website for rates – there is a fee for interior picture taking. You can have your 15 minutes of fame in front of the Andy Warhol Museum, located on Sandusky Street just east of PNC Park. It’s the largest museum in the United States dedicated to a single artist, showcasing Warhol’s colorful paintings, avant-garde films and experimental literature. Again, early evening & dusk are great times to shoot photos in front of the museum. Take pictures facing Sandusky Street and be sure to include the museum’s illuminated façade. When finished, you can gain album worthy water-side shots at North Shore Riverfront Park, a block south of the Andy Warhol Museum and nestled along the Allegheny River. You’ll find a pleasant respite from the crowded streets here, along with a roomy expanse of well-manicured lawns for multiple vantage points. PNC Park, downtown and the North Shore neighborhood give your photographer different backdrops in a relatively compact area. Make sure to capture some shots with Point State Park. Spring & summer wedding shots should be fortunate to find the iconic fountain shooting its 40-foot waterspout. Loop back towards Heinz Field to snap some shots near the Carnegie Science Center, a North Shore gem. This dome-shaped building has a modernist scope & scale that complements any nuptial wedding album. Also nearby is the newly constructed Rivers Casino, Pittsburgh’s waterfront gaming complex. Its contemporary, curved façade lends modern character to your wedding photographs. Nighttime offers the most opportune times to take pictures. The Carnegie Science Center has multi-colored spotlights, while the Rivers Casino has neon lights along its profiled front. Complete your wedding picture schedule with the West End Bridge in the background. The science center & casino area is an ideal spot to include Pittsburgh’s 3 rivers – the Allegheny, Monongahela and Ohio – in your memorable day.